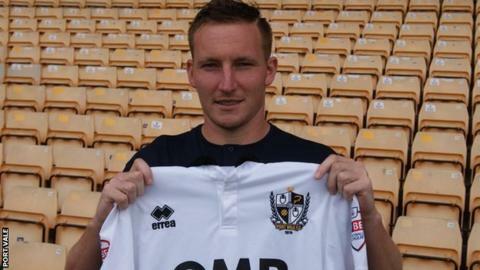 Torquay United manager Kevin Nicholson wants loan signing Achille Campion to seize his chance to impress. The 25-year-old joined on a month's loan last week, making his debut as a substitute in the 1-1 draw with Altrincham on Saturday. But he is like to start the Gulls' next match after Tyrone Marsh was sent off. "He's come in at a good time, his attitude's spot on, now he's going to get his chance and we'll see what he's got next weekend," Nicholson said. The Frenchman, whose contract with parent club Port Vale runs out next summer, played the final 24 minutes of Saturday's match. "He held it up well, he came on at a bad time as Marshy got sent off for soon after," Nicholson told BBC Radio Devon. "He held the line up as well as he could on his own, he showed some good touches, he's strong and obviously now he's got his chance as Marshy can't play for three games."